New 1/3 lb. Sirloin Burger. Two years after taking its previous premium burger off the menu, McDonald's is serving up new third pounders. The fast-food chain will begin serving the third pound Sirloin Burger for a limited time starting later this month, reports The Wall Street Journal. The new burgers, with three options topped with bacon, mushrooms or lettuce and tomato, will be bigger and beefier than other McDonald's offerings and will cost more, with prices around $5. Like the fast-food giant's other premium burger offering, the 'Create Your Taste' customizable platform, McDonald's first tested the sirloin burgers in Australia, reports Burger Business. 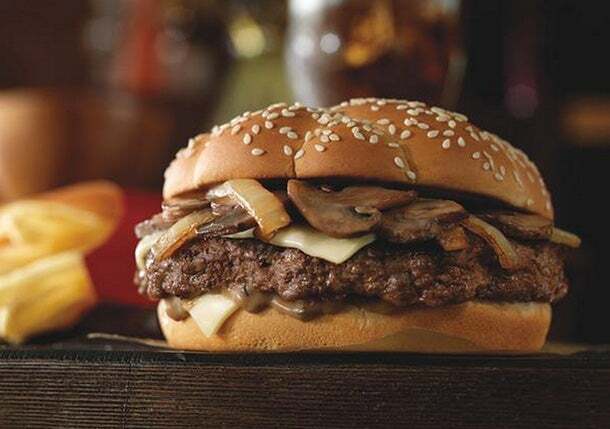 While premium burgers are standard for most fast-food chain, no other major fast-food restaurant currently offers sirloin burgers on their menus. The new burgers come two years after McDonald's last premium burger, the Angus Third Pounder, was removed from the lineup. In 2013, the fast-food chain took the $4 to $5 burger off the menu because it failed to catch on with customers in the same way the significantly less expensive Big Mac or Quarter Pounder had. As McDonald's struggles with sales under fresh leadership, the chain has been pulled in two apparently opposing directions: cutting costs and service time while serving more fast-casual-influenced premium offerings. Sirloin burgers may combat McDonald's super cheap, low-quality reputation, but they also go against franchisees' desire to trim down the menu. Don't bet on this limited-time-offering staying on the menu past the anticipated end date in late June.